Anyway, Life Partners was also on my radar and when I realized the Chasing Life creator also did Life Partners, I knew I'd have to watch it. I mistakenly thought Life Partners was about two best friends and one was a lesbian who was in love with her straight best friend, but lol no. It's just about two best friends and one is a lesbian but not in love with her best friend which yay. And it's so good. Just so good. Where are the rest of the movies like this? About growing up, being in your late twenties and falling in love and learning how to be in a relationship and learning how to adjust to the way your friendships change? This is something we all experience and deal with in our lives--but I feel like it's so rarely captured? But it's actually monumental and big. So yes that's what Life Partners is about! It's about becoming an adult and falling in love and learning how to be in a relationship as an adult and also it's about how your friendships change and that can BREAK YOUR HEART. I just don't have enough words for how super lovely this movie is and I cried a lot and maybe if you've ever experienced any of this you'll love it, too. If, like me, you love any story that values and treats non romantic relationships as fundamental and important to life and PRECIOUS, you'll love it, too? Plus, Leighton Meester is in it and super pretty and really carries her role well. Anyway, the writer is Susanna Fogel who apparently writes this stuff from her life...her best friend is a lesbian and they had a web series awhile back. She talks about her stuff as being stuff for people who like to feel things, and I agree. She's an absolute treasure, I wish she'd written more because she just really hits that sweet spot of female friendship that I long to see more of! And knew she was a kindred spirit because, lol, I AGREE. 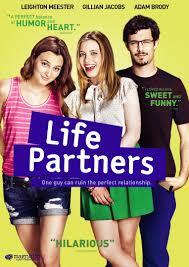 Anyway, check out Life Partners if you can! It's on Netflix! Because the truth is, women have been loving each other since the beginning of time. Friendships between women are one of the abiding structural features of our lives because our relationships to one another are passionately meaningful. Any literature that attempts to treat women’s lives seriously will include female friendships. It isn’t a genre. It isn’t a cliché. It’s a way in to talking about what we’ve been trying to talk about from the beginning: the human experience.